Bloomington is city that is found in Southern Indiana and offers a home to families and students alike; Bloomington is lucky enough to be a home away from home for all the students that attend Indiana University! Bloomington provides something for everyone, diverse neighborhoods full of character, a vibrant downtown, thriving businesses, and best of all access to Big Ten sporting events! The professionals here at Action Pest Control want to make sure that your Bloomington home or business remains free of the pests who also, unfortunately, call the large city of Bloomington home. We take pride in offering all of our Midwest customers with timely services and effective, budget-friendly solutions. Trust our professionals to provide you with the residential or commercial pest control services that you deserve and want! Contact Action Pest Control today to learn more about any of our highly effective solutions to common Indiana pests! At Action Pest Control we offer four options of residential pest control for our customers to choose from. Through any of our comprehensive residential pest control programs, you will be sure to receive effective pest management solutions that are always delivered when it is convenient for you! By partnering with us you will have the peace of mind knowing that your Bloomington home will be protected from common household pests all year long! Essential pest control - This our most basic, yet still very effective program that provides customers with exterior pest defense services and cobweb removal. Advanced pest control - The advanced program provides customers with both exterior pest defense and interior pest treatments. It also includes cobweb removal, window sill vacuuming, the placement of exterior rodent stations, rodent control services, as needed pest proofing, unlimited services calls, and services that are fully guaranteed! Complete pest control - This program includes everything that is found in the Advanced pest control program, but also includes an annual attic inspection, termite monitoring services, and a termite inspection. Know what bed bugs look like: adults grow to about 1/4 of an inch in length; they are reddish-brown in color, oval and flat in shape, are wingless and have six legs. Know what the common signs of a bed bug infestation in your home are: tiny droplets of blood or black streaks found on linens, mattresses, and box springs; piles of their molted skins underneath of pillows, mattresses and box springs; in the case of a large infestation you may notice a musty smell in the air. Keep belongings up off of the ground of public places. Inspect a hotel room you will be staying in before bringing your luggage into it. After returning home from a trip, immediately wash all clothing in hot water and sanitize all suitcases that were used. Do not purchase used mattresses or box spring for your home or business. Contact us today to schedule a bed bug inspection for your Bloomington home or business! Inspection - A complete inspection of your facility is completed. Monitoring - Monitoring includes the use of glue boards, mechanical traps, insect light traps, pheromone traps, rodent bait and monitoring stations. Identification - Proper identification is key to the success of any treatment plan. Sanitation - Putting into place proper sanitation measures is key to reducing the need for product application. Exclusion - Keeping insects and rodents outside of your facility, in turn, reduces or eliminates the need for product application. Harbor Reduction - The elimination of as many resting and nesting spots in and around your facility will help to deter pests. Mechanical Controls - Examples include multi-rodent catch traps and insect light traps. Environmental Controls - We will identify conditions that, if corrected, will work to reduce pest problems. Product Application - If needed our professionals will take their time choosing the right product to use in your facility to help control pests. Documentation services - We always provide detailed documentation of pest activity, conducive conditions, and product application. Contact us today to learn more about Action’s highly effective commercial pest control services for your Bloomington, IN business! Mosquitoes are a problematic pest who show up each spring and stick around until the fall. Mosquitoes bite, they create itchy welts, and they can spread disease. What is there to love about mosquitoes you may be asking yourself? The answer is, basically nothing which is why the professionals at Action Pest Control have developed a highly effective mosquito control program to greatly reduce their numbers on your Bloomington property throughout their entire active season. 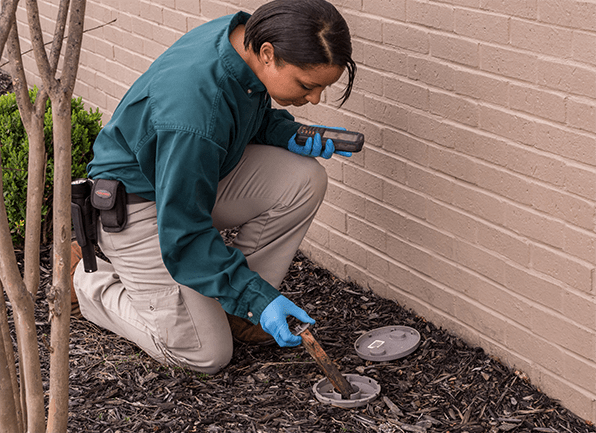 Our mosquitoes control services include an inspection by one of our professionals to find local mosquito breeding and resting areas on your property. We then provide treatment using EPA approved mosquito control products to reduce the number of incoming mosquitoes and to prevent mosquito larvae from being able to hatch into more breeding adults. With our help, you will once again be able to enjoy your Bloomington backyard!